Located in the luxurious Gainey Ranch neighbourhood, this elegant hotel offers luxury guest rooms and a state-of-the-art fitness centre. It offers a free local transfer service within a 5 mile radius.Full kitchens are provided in all rooms at Gainey Suites Hotel. A flat-screen TV and an iPod docking station are also available.Guests at the Scottsdale Gainey Suites Hotel can enjoy many activities only steps from the hotel's front doors. Gourmet restaurants, relaxing spa services, top-rate golf courses and upscale shops are all located within walking distance.The Gainey Suites provides a daily breakfast buffet and an evening hors d'oeuvres hour.Car hire is available at this hotel and the area is popular for golfing. OdySea Aquarium is 5 km from Gainey Suites Hotel, while Desert Botanical Gardens is 12 km from the property. 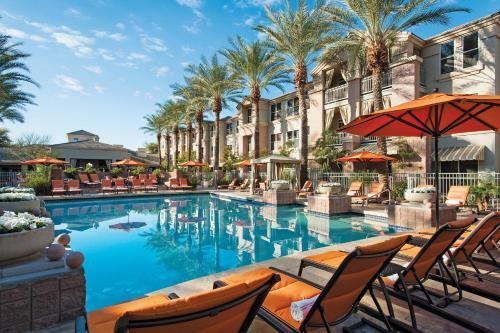 The nearest airport is Scottsdale Airport, 7 km from Gainey Suites Hotel. Gainey Suites Hotel is the best Scottsdale lodging choice for your trip to Arizona. With numerous amenities for guests such as room service, 24 hour front desk, gift shop, you will wake up at Gainey Suites Hotel feeling excited every day for your time in Scottsdale. Don’t let this amazing reservation opportunity pass you by, book your stay at Gainey Suites Hotel today to make the most of your time in Scottsdale, Arizona.